The Atlas Copco LS 14 cut-off saws rental is available in Rochester NY, Ithaca NY and Upstate NY from the Duke Company. Simple and strong: LS 14 are simple in design. That means less maintenance and more done. Power to cut:The power-to-weight ratio is high and the direct drive makes the saw efficient. Sight for safety: The cutting face is clearly visible while you are working. 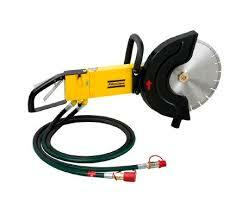 What to cut: Put the saw to work on concrete, reinforced concrete, asphalt and steel. Use dry and wet diamond discs and abrasive steel cutting discs. Simple in design: The direct drive and simple machinery equates to higher productivity and reduced maintenance. A lightweight cart you can use the saws for floor, road and other light surface jobs.